The 7 Best Skate Shops in Kentucky! Every skateboarder needs a great place to get their boards, trucks, and wheels. The great shops of Kentucky are run by local skaters, too, so you know you’re in good hands. No matter what you’re looking for, expect a great selection and expert advice at the best skate shops in the state. If you want to know all about skateboarding, ask a skateboarder. If you want to find the best source of skateboarding equipment, parts, accessories, and service, visit a store that’s owned by a skateboarder. That’s what you’ll find at Home Skateshop in Louisville, Kentucky. With well-known quality brands for gear, accessories, shoes, and clothing like Bones, Adidas, Brixton, Becky Factory, 917, and Slave, stop by any day and talk to someone who knows the sport. 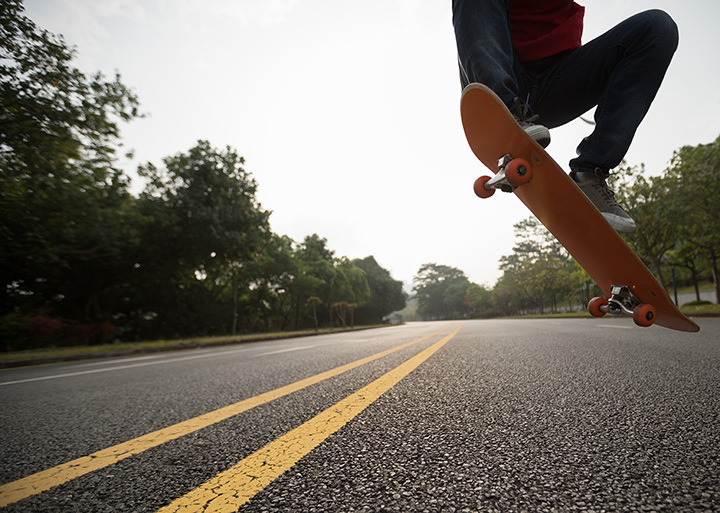 It doesn’t matter if you’re new to skateboarding or a seasoned boarder, eventually you’ll need your board repaired or replaced and something to make your skateboarding safer, easier, or more enjoyable. It’s nice to know that Galaxie Skateshop in Newport, Kentucky exists for that very reason. Carrying a full line of decks, you can talk to one of the friendly and helpful staff who can answer your questions and find what you need. Open every day. More than 50,000 square feet of skateboard heaven is waiting for you at Ollie’s Skatepark located in Florence, Kentucky. This is one of the best indoor skate parks around, and you’ll have fun no matter what your skill level is. If you want to improve your skills, take a 3-hour lesson for just $12 and you can skate all day for $20. Also allowed in the skating area are scooters, bikes, and roller blades, and if you need some energy to keep skating, stop by the concession area. Before you leave, remember to visit the skateboard shop and pick up what you need. Hooper’s Outdoor Center is Paducah, Kentucky’s #1 source for outdoor sports and recreational equipment and supplies. Specializing in kayaks, bicycles, and skateboards, Hooper’s has 2 levels of clothing, and everything you need to make your favorite activity safe and fun. Voted “Best Place to Buy” kayaks, men’s clothing, and bicycles in 2018, the key to this store’s success since opening in 1997 is that they only sell the best merchandise at reasonable prices so customer come back. You can put on a happy face at Bicycle Face. That’s because you can fast repairs, better builds, and replacement parts in a hurry. The owners know that you’d rather be out there enjoying the thrill of the ride and soaking up the sun than spending down time waiting. They get it. That’s why they offer a la carte services and do preventive check-ups, too. They’ll even help you find the right bike or board so you can get the most out of the time you spend doing what you love to do. Howard’s Cycling & Fitness in Bowling Green, Kentucky wants to be your go-to one-shop location for everything you need for skateboarding, bicycling, and locksmithing. You can choose from a store filled with great skateboard choices from companies like Thunder, Almost, Plan B, Foundation, and Deathwish. Everything you need is there, but if you can’t find what you want, the helpful in-store specialists will help you find it. Western Kentucky University students get a 10% discount, too. You won’t find high-pressure sales folks at Gear Up Cycles in Murray, Kentucky. You will find friendly, helpful people who know about things with wheels, though. As the state’s only full-service bike shop, they also take great pride in servicing and carrying supplies and equipment for skateboards. The large showroom features products from name brand manufacturers like Yeti, Bianchi, Surly, and Wethepeople. You can get information on store-sponsored group rides and other fun events. Open Tuesday through Saturday from 10AM until 6PM.